Another Monday...Time for another sketch challenge from MJ at TechnoStamper. Hope you all had a wonderful Easter. I took come creative liberties with today's sketch. In place of the circle on MJ's original sketch I used my Spellbinders Labels 4. For the main stamped panel of my card, I used the Ghosting Technique with the newly released Natures Silhouette II from ISC. 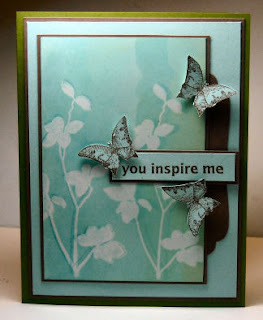 I stamped a few butterflies from this same set, cut them out and popped them up around my sentiment. 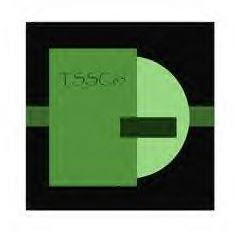 Save 10% on your ISC purchased by using code apr09 - good through April 24, 2009. Have a great Monday, thanks for stopping by! ETA - The Ghosting Technique is similar to versamark resist. Here's what I did...Stamped images on glossy card stock with Versamark, let dry. Rip a piece of card stock - you'll use this as your guide for applying your inks. Place ripped card stock a 1/2" from edge of card stock, using Ink Blending Tool (or sponge daubers) apply ink. Move scrap card stock, repeat with another color of ink - note you'll blend that ink over your first color. Repeat until panel is covered. Buff off any extra. Reink your image in the darkest color ink - stamp over versamark images (use a SAMJ if needed). Let dry a second, then buff off. I hate Vista. >:( It annoys me. But I love this card! Sooooooooooo pretty! So soft and pretty, Lisa! Love what you did with the circle portion of the sketch! I love the substituting you did! Those images are WONDERFUL!!!! Gorgeous card! Lisa, This card is so beautiful. I love all your work and look forward to seeing everything you post. I am new to TJ and would love to know how to do this Ghosting Technique. Can you help? I am also on Vista and miss my Windows version terribly. Lisa this card is fabulous. Love the butterflies. Thanks for playing. Don't forget to link.